It has been a while since I posted anything, but we certainly have been busy during the past week! 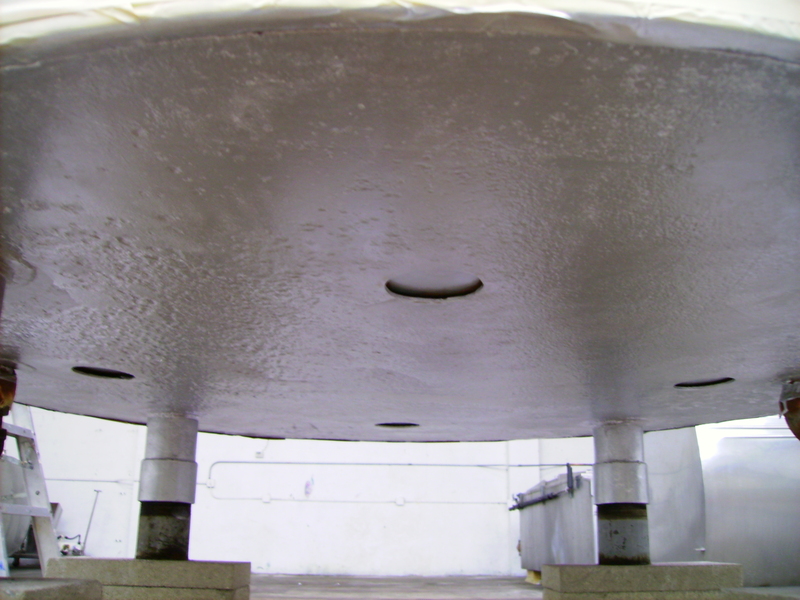 Here’s a picture of the underside of the kettle, all cleaned up, painted and ready to be installed. What a difference! 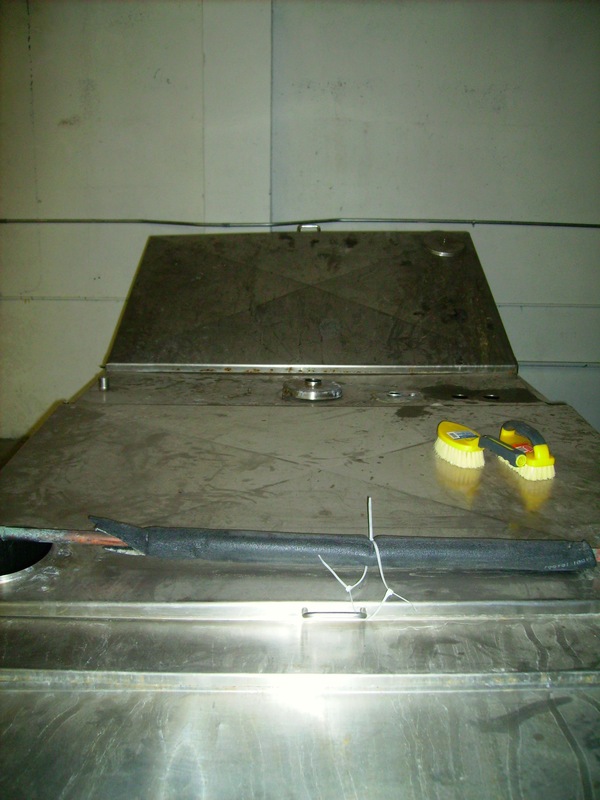 Here’s a couple pictures of the Hot Liquor Tank, which will be the next thing we’ll clean. The outside is pretty grimy, and you can see some mineral deposits on the inside that need to be removed. 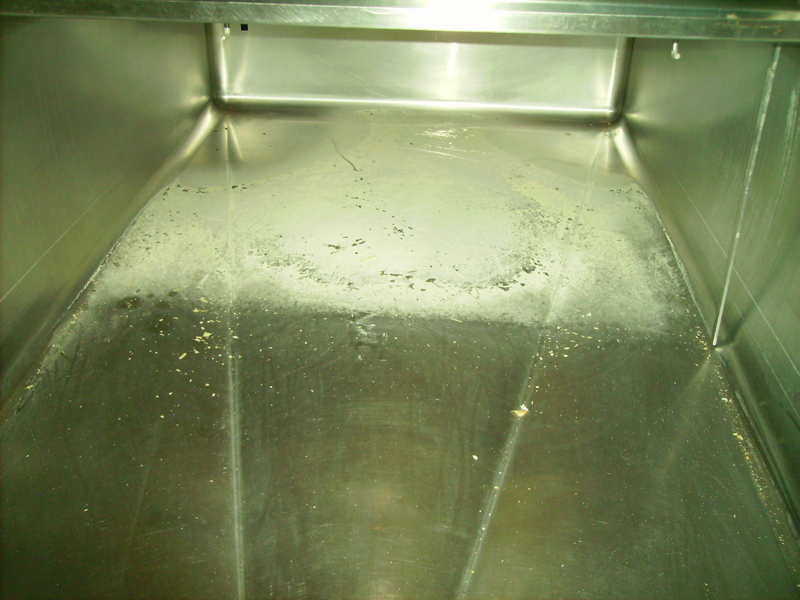 A little food-grade phosphoric acid should remove the mineral deposits and get it nice and shiny again. The floor plans and site plans have been completed, and next week I have an appointment with the Department of Building & Safety to do a preliminary review of our plans. They will be checking that everything in the plans is compliant with building codes, that we have enough exits and parking spaces for the proposed number of occupants, etc… Wish me luck! 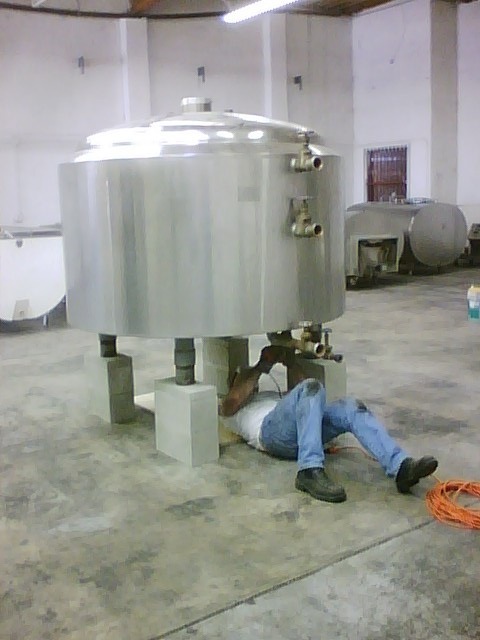 This weekend we spent some time cleaning up our brew kettle. After sitting in the same spot for 13 years in it’s former home, it developed a bit of grime and rust on the steel plate underneath the kettle. This plate isn’t stainless, like the rest of the kettle, but it sits beneath the outer steam jacket and acts as a protective base-plate for the whole tank. 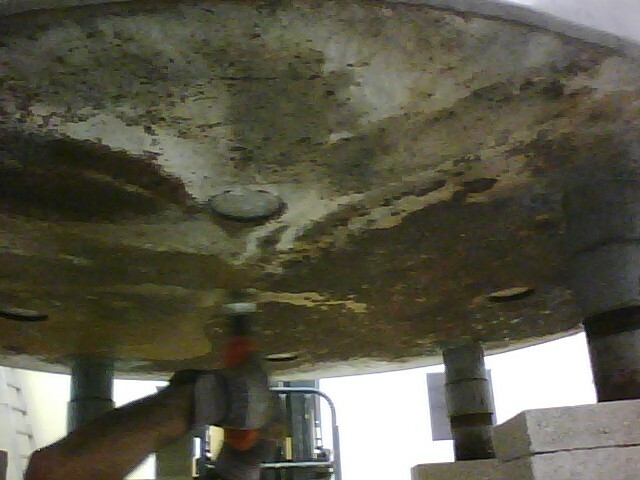 In the pictures below you’ll see that we lifted the kettle onto some concrete cinder blocks, so it would be easier to work underneath. The first step is to get rid of the surface grime & rust with a wire brush, then treat it with a little phosphoric acid to remove the rust and mineral deposits, and re-condition the steel. I’ll post more pictures to show our progress on this later in the week. 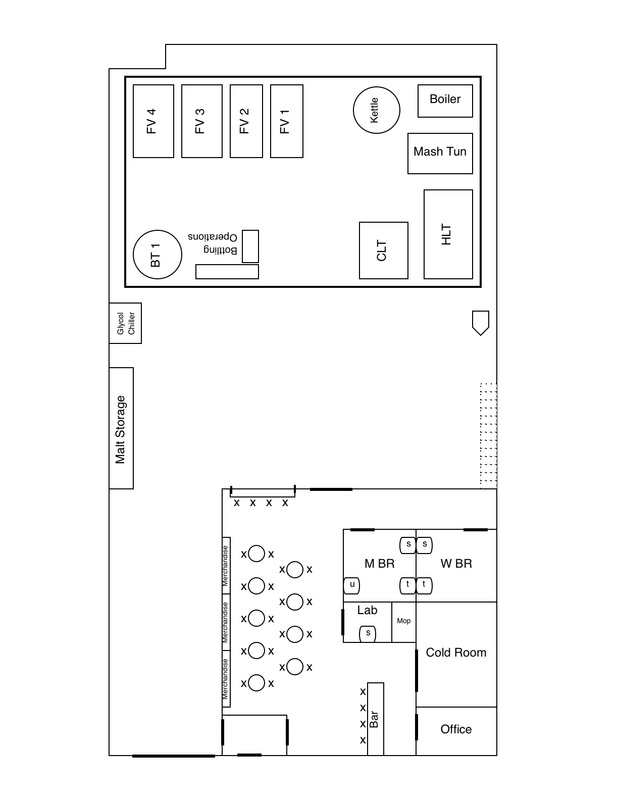 Today I had a meeting with our Expediter, and started to review the floor plan for our tap-room. An Expediter is basically a person who is an expert at dealing with the red-tape of the city’s various permitting systems. They make sure your applications are filled out correctly the first time, etc, and handle all of the other paperwork so you don’t have to go crazy running around the city all day. We have to apply for a Conditional Use Permit to serve alcohol to the public in the City of LA, and the application for that permit is quite literally an exercise in bureaucratic gymnastics. Just as an example, you have to have a map drawn up showing a 500-foot radius of your building, as well as all of the occupants within that radius. And then 15 copies of that map (I am not exaggerating) need to be sent out to various departments within the city. And the maps have to be dated within 90 days of the date on the application. I’m sure that sounds pretty boring though, so I won’t go on about it anymore. It was however, very exciting to see the floor plan, and to start picturing how it will eventually look. We had to change a few of my original floor plan ideas around, to make things comply with the building code, but it is definitely starting to look cool! I’ll post the floor plan up here when I get a finished copy of it, so keep an eye out for that. Here’s some more pictures. These are from June 18th, when we moved the second half of our equipment up from San Diego. Again, I had intended on getting more pictures of us in action, but we had our hands very full, so I ended up with just a couple. 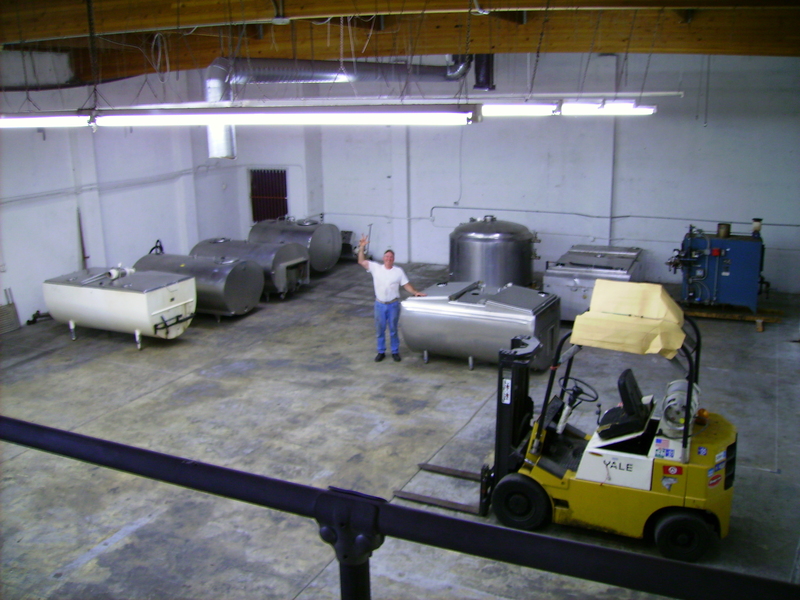 My dad (Steve) celebrates after unloading truckload #2 of equipment into our brewery. 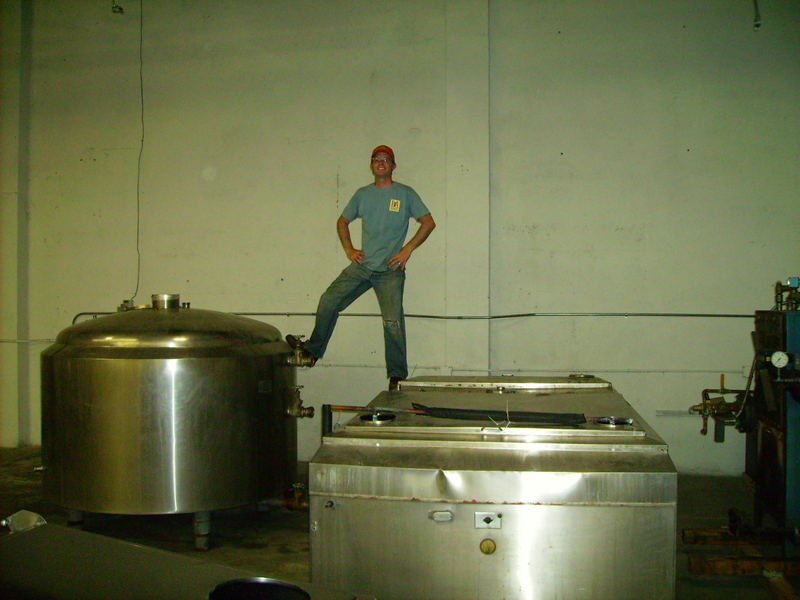 He’s standing next to the Mash Tun, and in the foreground is our forklift, which we bought with the package from Alesmith. I don’t know why, but I think it’s kind of cool that we own our own forklift…there must be some sort of natural manly affinity for heavy machinery. The big blue box in the back corner is the steam boiler, which will produce the heat source for our brewhouse. The equipment is roughly in the location it will live in when the brewhouse is assembled, but we still have to cut into the floor to dig new drains, so we’ll have to move it out of the way when that construction takes place. This picture definitely gives you a sense of scale and proportion though. 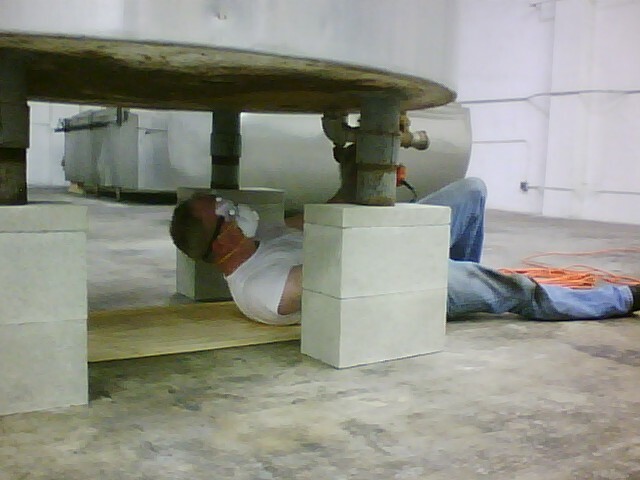 On the Brew Kettle, just under my foot, you’ll see pipes sticking out from the side of the kettle. These are where the steam enters the kettle, in three different zones (top, middle, bottom), which allows you to better control the temperature in the kettle, and to get a really good rolling boil. The kettle is jacketed, so the steam circulates around inside the jacket, and heats the contents of the kettle, but never comes into contact with the wort in the kettle (same basic principle as a double-boiler on your kitchen stove). That’s all the pictures I have for now, but I’ll try to post more soon. 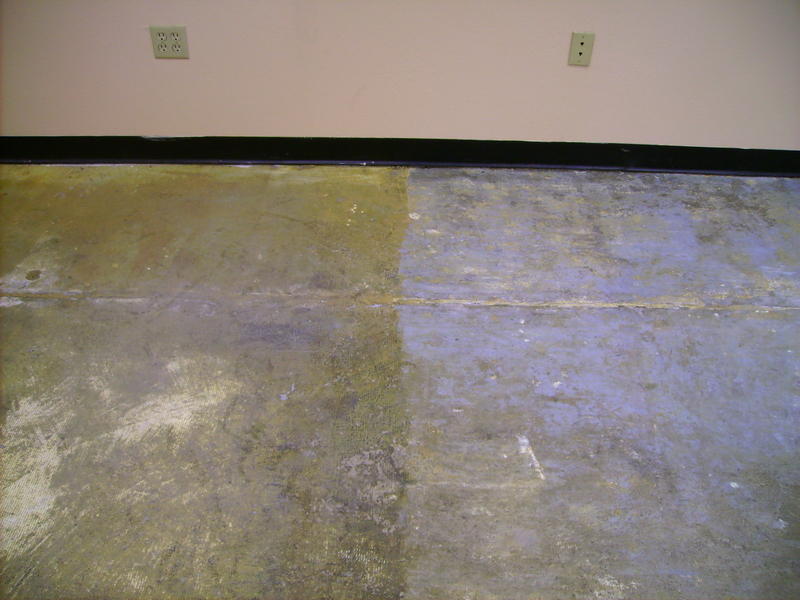 This past week I’ve been working in the office/tap-room area, pulling up carpeting and trying to clean off the nasty carpet glue from the concrete floor. Not very exciting I admit, but still a necessary part of the process.